Incorporate a fun design into the tile for your upcoming renovation project, whether it is in your home or business. Here at Limelight Tile & Ceramics, our tile designers will help you personalize our tile patterns or create something special for your project. Custom ceramic tiles are a great focal point and can really improve the atmosphere of a room. 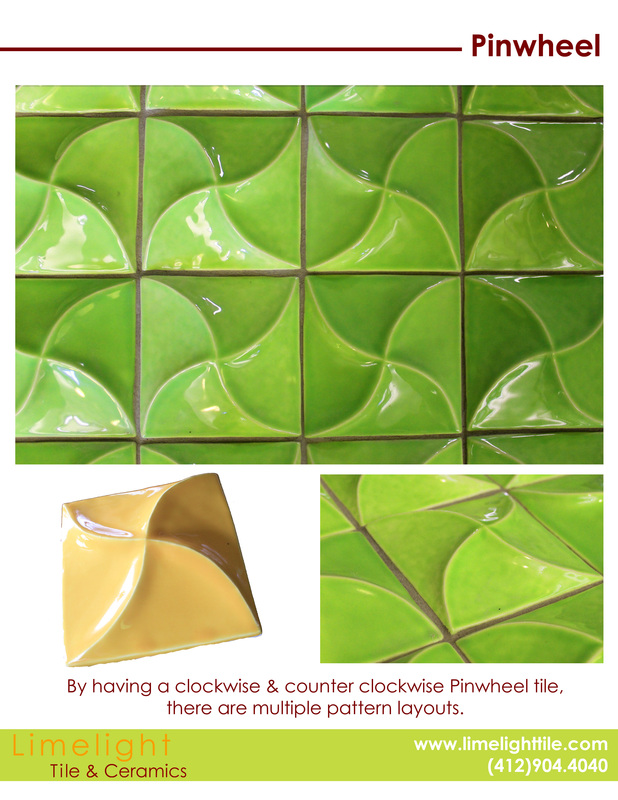 Our Pinwheel tile design is very versatile because it can be used in the clockwise and counterclockwise directions to create multiple ceramic tile patterns. With this tile design, you can mesmerize guests in your home or business. The tile direction is not the only thing you can select when you choose the Pinwheel design because it is available in more than 300 colors and glazes. We have a vast selection of colors to make choosing shade easier. Contact our team at Limelight Tile & Ceramics right now to discover more about the Pinwheel pattern and our patterns for restaurant tile.